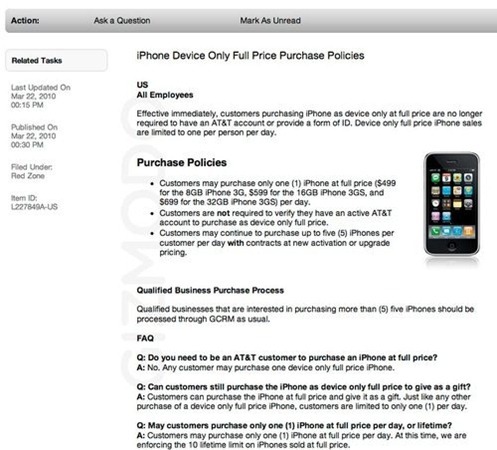 It has been confirmed by an Apple Store employee that Apple will now be selling iPhones to customers without having to purchase an AT&T plan. Anyone can purchase an iPhone from their retail stores but there’s a limit of purchasing one iPhone per customer per day, and a customer can only purchase 10 of them in their lifetime. is there a way now to unlock iphone 3gs with bootloader 5.09? REALLY AND I BET ITS 3.1.3 ON THESE PHONES CANT UNLOCK THAT CAN WE??? Please consider fixing this comment it's based under the assumption that the iPhones will come with iPhoneOS lower than 3.1.3 and the new baseband. Currently we can't jailbreak and unlock the new baseband, so anybody going out there to buy an iPhone will get a big surprise if planning to use it outside AT&T. Unfortunately, I've got 3.1.3 with 05.12.01… So, need to wait..
how can I pay an apple I phone 3G 16 G, W/O AT&T????? To uｎｌｏｃｋ a device is easy, but to make sure your iphone remains lockedbecame harder as there are many unprofessional uｎｌｏｃｋers theese days.I saw here in many post and also lot of my mates was locked back by the carrier and got iphone bricked. Make sure you will use the uｎｌｏｃｋ team wich had been selected the best uｎｌｏｃｋer of the year, like ATTIPHONEuｎｌｏｃｋING or my#imeiuｎｌｏｃｋ. just google atttiphoneuunlockingcan սոⅼοсking any AT&T devices in totally no time. Their facebook page is fantastic as well! !